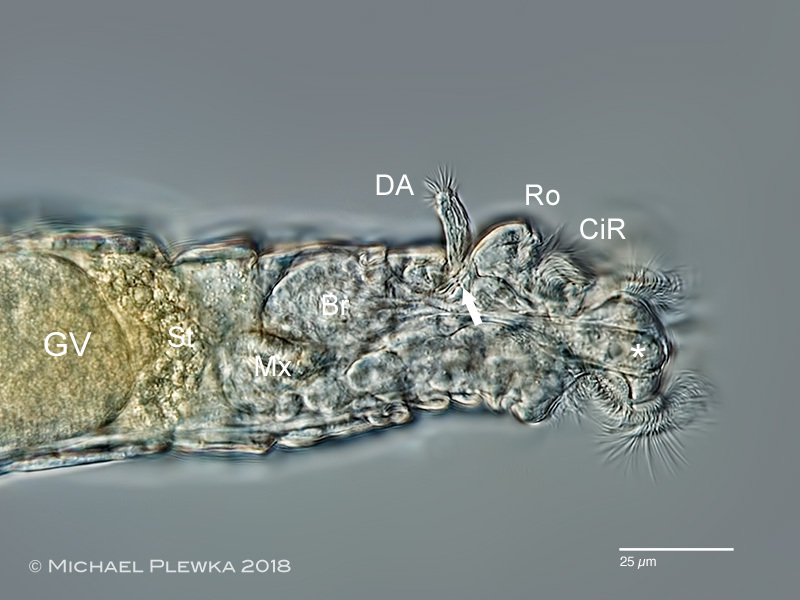 Rotifers of Germany and adjoining countries: Habrotrocha tripus Murray 1907, Habrotrochidae/ Bdelloidea/ Rotifera/ Syndermata. Habrotrocha tripus, swimming (not whirling) specimen. Especially after a dry season the specimens of this species are very active. While most Habrotrocha species move by creeping H. tripus is often swimming like for example Rotaria rotatoria. 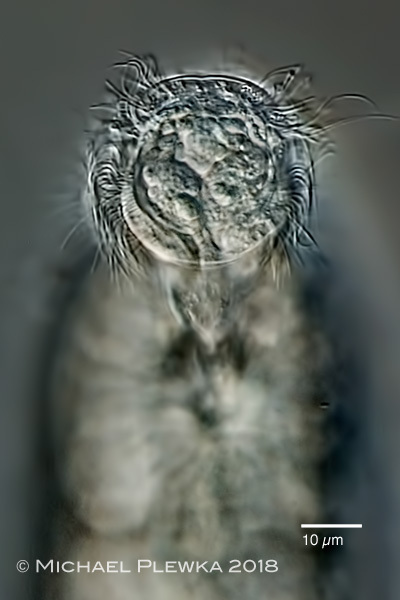 Habrotrocha tripus, creeping specimen. This species has certain traits that make it easy to distinguish this species from other Habrotrocha species. In this image one can see the two spurs (marked by arrowheads) and the dorsal toe (arrow) which is more or less always extended, so that it looks like 3 "feet". Hence the name: "H. tripus". 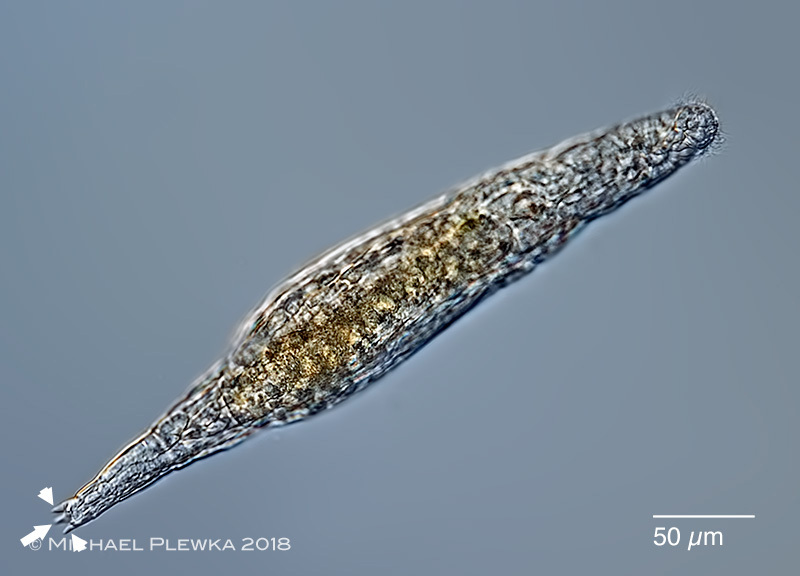 When moving forward this species does not show the leech-like moving of a typical bdelloid rotifer. 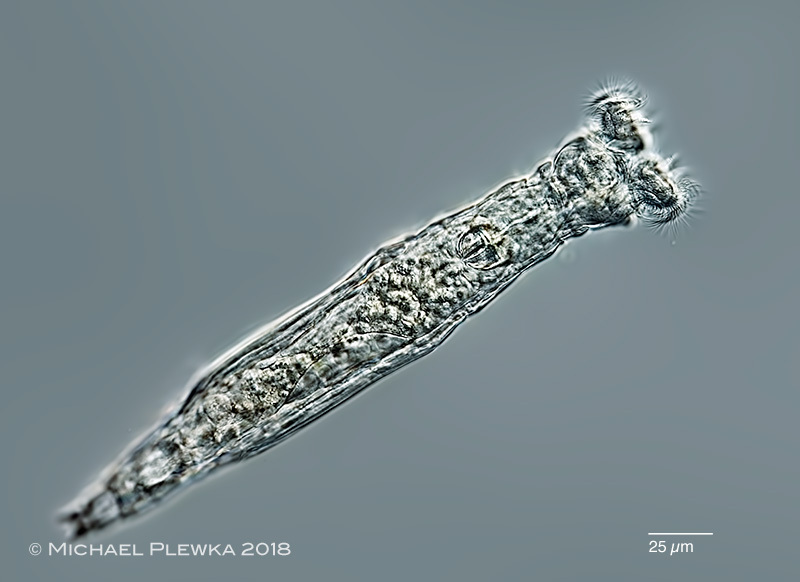 Normally while creeping a habrotrochid or philodinid rotifer expands the trunk, the head/ rostrum sticks to the substrate, the body contracts, the foot sticks to the substrate, the body expands again and so on. Not so with H. tripus. 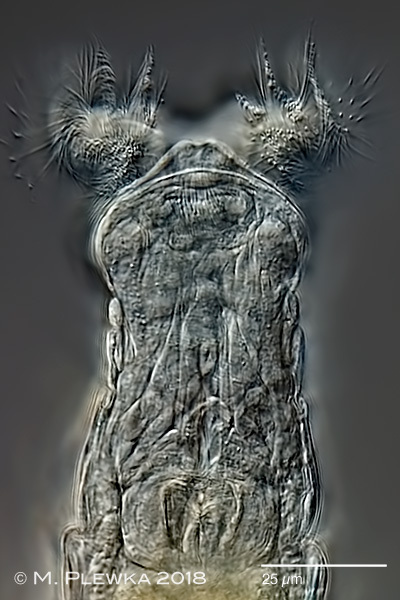 The cilia of the rostrum move the whole animal forward, resulting in a "sliding" movement like that of Adineta rotifers. The foot as counterpart is then moved forward by bending of the foot and not by contracting like other rotifers do. 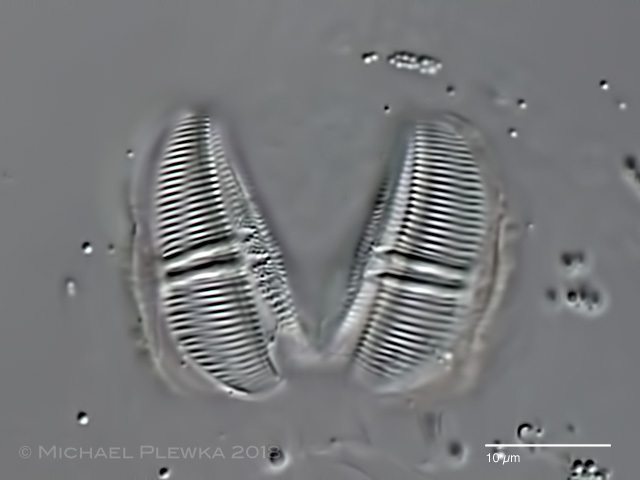 Habrotrocha tripus, whirling specimen in lateral view, 2 different focus planes. Upper image: the arrow marks the base of the rostrum. Even when whirling the long cilia (CiR) protrude the rostrum. Lower image: in contrast to other habrotrochid species the diet is not uptaken in the form of defined pills in the stomach (St), but as a granular mass. The asterix marks the hypodermis cells in the trochal discs. The arrow at the base at the rostrum points to a structure that might be a sensory organ, the phaosome. Br: brain; CiR: Cilia of the rostrum; DA: dorsal antenna; GV: germovitellarium; M: ciliated mouth; Mx: mastax; oe: oesophagus; Ro: rostrum; TD: trochal discs. 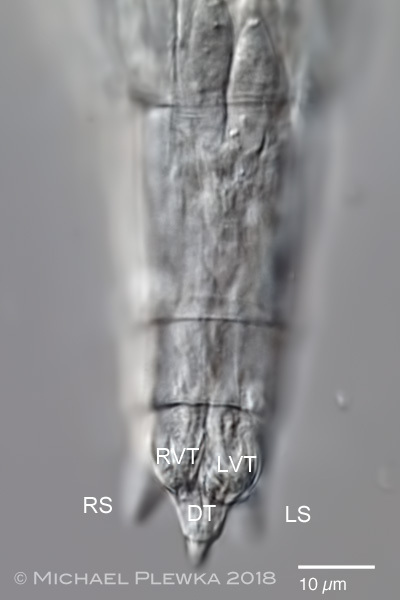 Habrotrocha tripus; left image: rostrum of creeping specimen with long cilia. Right image: Head of whirling specimen, focus plane on the upper lip. 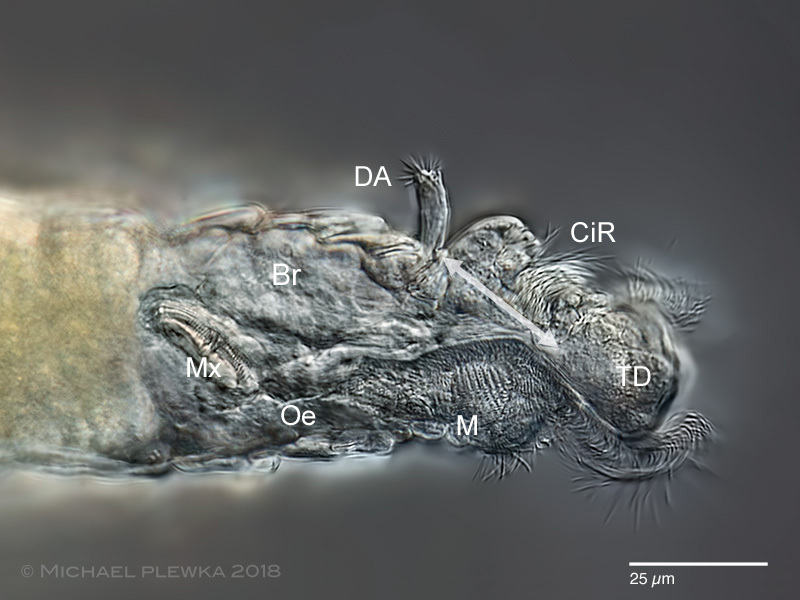 Habrotrocha tripus; foot, ventral view; focus plane on the dorsal toe (DT) which has a tip. RVT/ LVT: right and left ventral toes; RS / LS: right and left spurs (in background). 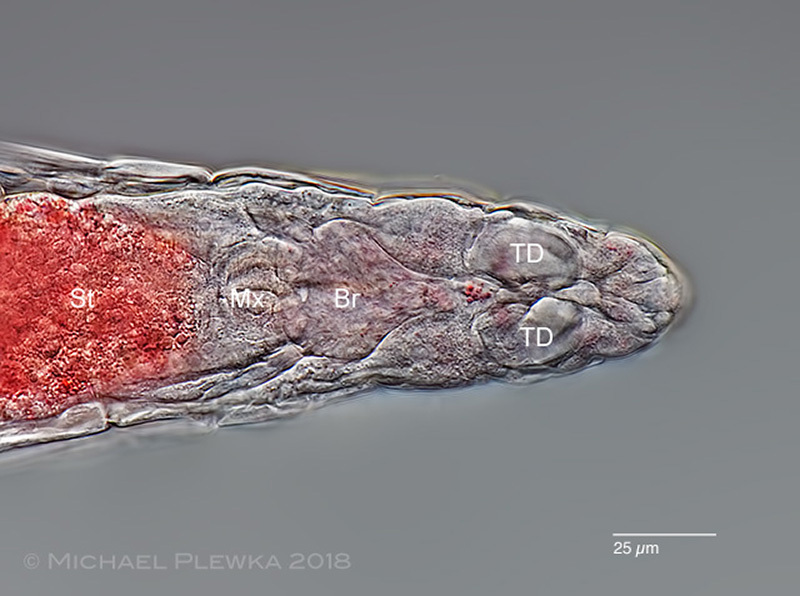 Habrotrocha tripus; specimen stained with NeutralRed. This image shows another specific feature of this species. Neither is there a stomach lumen nor is the diet stored in pills like in other Habrotrocha species, which is also mentioned by Murray 1907. Br: brain; Mx: mastax: St: stomach; TD: (invaginated) trochal discs. Habrotrocha tripus; trophi (cephailc view) with dental formula 2/2. 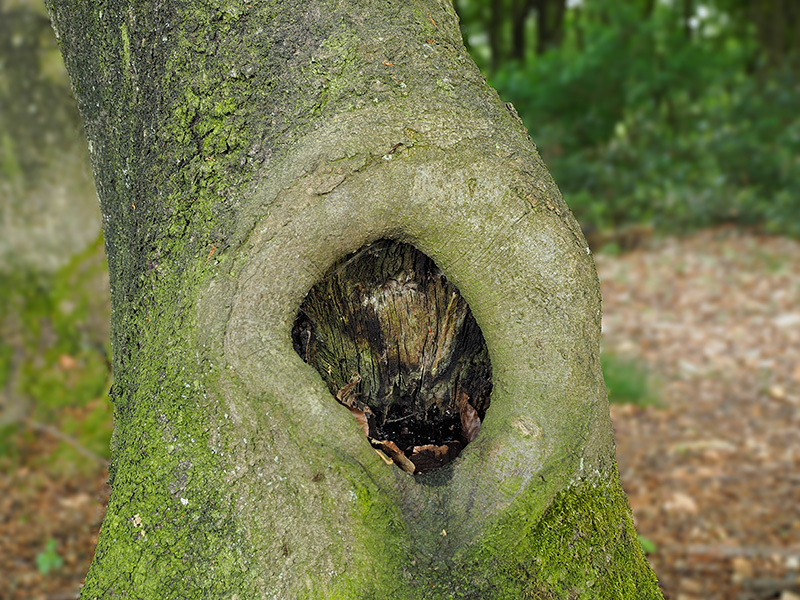 Similar species: Because of the occurence in a very special habitat H. tripus may be confused with Habrotrocha thienemanni, which also occurs in treeholes, but the latter has a two-lobed upper lip, the dental formula is 2+1/2+1 and the toes are different.